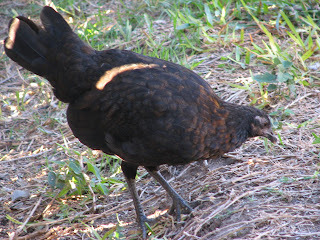 I first I thought Doug was teasing me yesterday when he said we had a chicken in our backyard. I thought it was some sort of post-Halloween joke, especially when I went to look and it wasn't there. Then this morning I heard Dante in some sort of tussle and clucking from our patio roof. I woke Doug and we went outside but didn't see anything but a crow. Maybe I was falling for Doug's power of suggestion and started thinking a crow sounded like a chicken. A little bit later, Doug locked the dogs in the house and called me to the backyard. There was definitely a chicken. We're not sure where she came from. Maybe someone in the area thought it would be cute to raise a chick and thought a grown chicken wasn't so cute. Who knows. But given that it looked hungry, and that we have several bird feeders (with birds spilling feed on the ground) in our yard, we expect her to be back. I have 15 of these in my backyard. Except they're there on purpose. My sister raises them for FFA...they're nasty nasty things. Chicken mystery solved. It belonged to a girl up the street. One of the neighbors caught it and gave it back. People are no longer speculating on what was the in Dr. Pepper Doug was drinking when he first saw the chicken. That would put anyone in a Fowl Mood! My wonder is how the dogs reacted- did they see it?